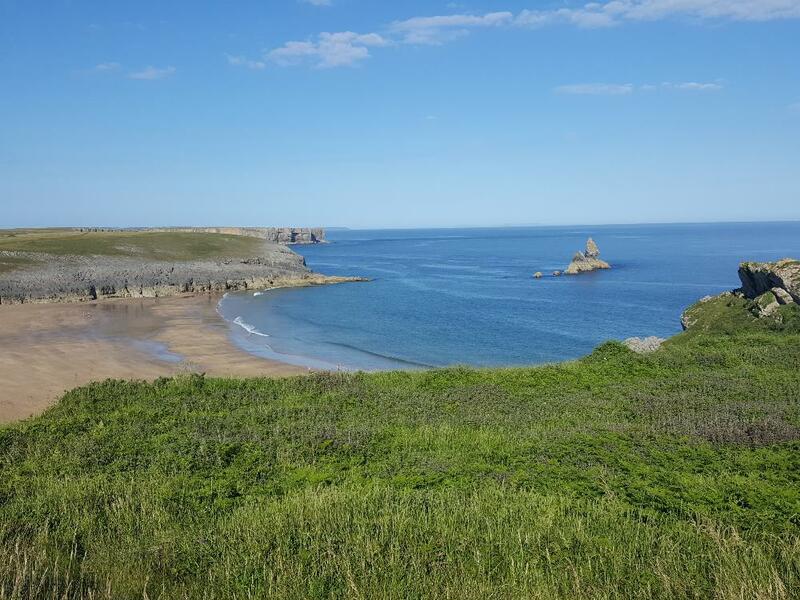 Broadhaven South is a stunning beach in South Pembrokeshire with several route options for open water swimming. Broadhaven South, not to be confused with Broadhaven further north, the site of the famous Pembrokshire Triathlon, is a beautiful beach in south Pembrokeshire, which is very popular with tourists and rightly so. The beach itself is stunning, with clean, golden sand and extremely clear water which has that lovely green/turquoise colour when the sun's out. The bay is about 500m wide and sheltered from the oncoming swells, it's a great place to spend some time. The rocky island in the bay is called Church Rock, so called due to it's shape from certain angles. Don't let this calm scene fool you though, in storms in the winter months it is fairly common for waves to reach 20 feet and engulf Church Rock when they roll in. Broadhaven South is close by to Bosherston Lilly Ponds, St. Govan's Chapel and Barafundle Bay, so it's easy to see why it's so popular. All of these other areas of interest are accessible on foot, with fantastic views of the coast. Broadhaven South bay is sheltered and has clear water and a beautiful curved beach. It is a fairly short swim that can be repeated as many times as required if you would like to get some distance in and consists of a circular loop of the bay, which is approximate 4-500m across. This is a good option for those who need coaching or want to get some practise in for an event. 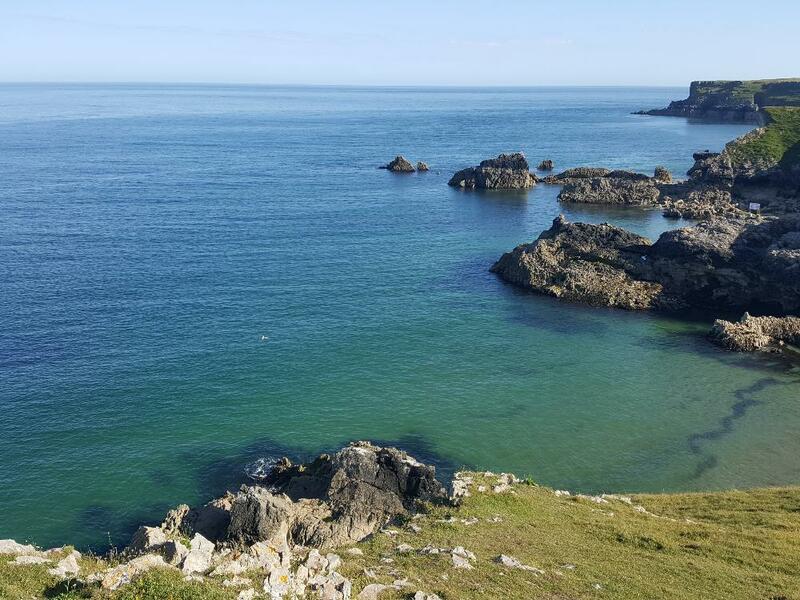 This is a short swim but in some of the clearest, most turquoise waters we know of in south Pembrokeshire. Starting at Broadhaven Beach we will take you around the northern headland to a small hidden cove and then onwards around the craggy coastline, exploring coves as we go. There's another deserted beach only accessible by sea after about 1km where you can opt to get out and chill/sunbathe or explore for a while. From there we will double back and head back to Broadhaven South Bay, where you have the option to head back to the beach or continue swimming across the bay to double back to where you started. Church Rock is the local name for the large rock about half a kilometre offshore at Broadhaven South, so called due to it's church like shape from some angles. The rock is a tempting landmark to swim to, but don't be deceived by it's apparent close proximity to the mainland. In fine, calm conditions this is a very pleasant swim; but when that sun goes in and the swell gets bigger, this swim requires some nerve. On a fine day the water is crystal clear, with shafts of light bouncing through the depths, everything highly visible. This can change very quickly to cold and black and choppy and for this reason this is an advanced level swim only. The conditions are also subject to rapid change, so this swim is highly open to change at short notice if safety is compromised. 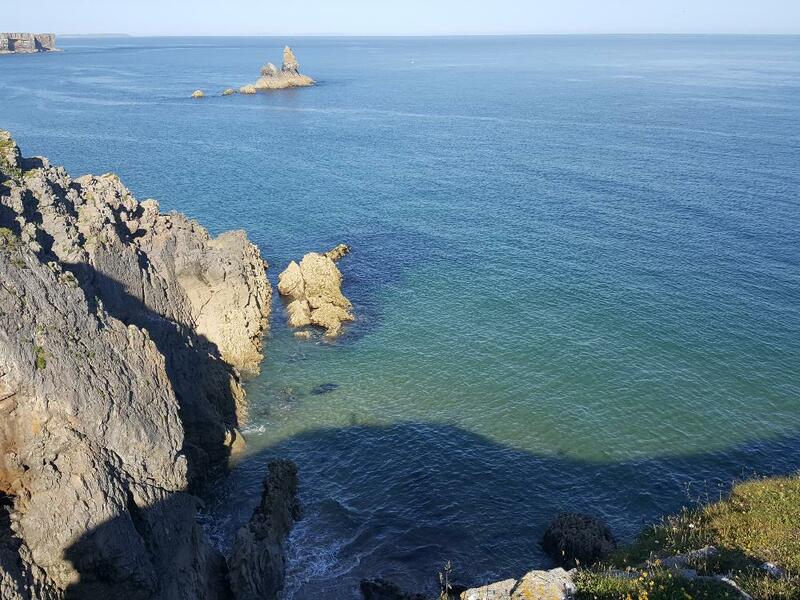 The Church Rock swim is for more advanced swimmers as you do leave the safety of the bay and for this reason it may be subject to cancellation if weather or sea conditions put safety at risk. There are also a lot of people on this beach in the summer months. The beach is down a steep path and sand dune, which can be tiring to get back up if you bring a lot of gear - travel light. There is a large paid car park available. When you pay to park here you also have parking rights for Stackpole Quay and Bosherston Lilly Ponds.. There are no changing rooms so open water swimmers get changed by their cars and walk to the beach, which is just 2 minutes from the car parks, or you can get changed on the beach and leave your gear there. There are showers up near the National Trust building behind the toilets. There are no shops at the beach but there is often an ice cream and / or snack van in the car park who put in a regular appearance. There are public toilets near the car park. This beach is dog friendly year round - please clean up after your dog! There are no bins on the beach so you will need to carry your poo bags back up to the bins near the National Trust kiosk. Click here for a full list of everything you would need, but the core essentials apply. Click here to see a lit of the sort of wildlife you will see around Broadhaven South. The National Trust also have implemented a great idea up at the small kiosk at the top of the beach whereby visitors can list the land and sea animals and birds they have seen that day - it's always interesting to check it out to see what's put in an apperance! Click here to book your swim.